This is one of the coolest feature and hacks in Windows 7 that let’s you customize the Logon background image at the Welcome Screen. The new version of WinBubbles lets you change the wallpaper directly at the Welcome Screen without registry hacks and conversion tool to resize the wallpaper and make the file size less than 256kb. The great thing is, you don’t need to browse and find the best wallpaper inside your desktop. WinBubble will automatically convert those built-in free high-resolution backgrounds available and let’s you change them quickly and easily. The automatic conversion code was tested from 3400-4300 jpeg images in different file sizes. You don’t need to worry about the file size anymore. It was designed for quick and instant conversion tool. For Geeks, read here on how to change the background manually. Just launch the application and go to Windows 7 Tab and choose which background do you want to use and click View to see the results. To launch the application while on the Welcome screen, Click the “Ease of Access Center” option to activate the unique feature. You can press Win+L to test the feature and after that you can launch the application by clicking the lower-left side of the screen. Many programs and installation disc now are compiled in .iso format. Making a copy or burning them in Windows 7 is very easy. A built-in Right-Click Menu will launch the Windows Disc Image Burner to burn .iso files directly within Windows without the need of third party tool. ISO File is a disk image or copy of data of a DVD/CD-ROM. To verify the disc after burning, click to check the option as shown in the picture above. It is supported natively in Windows 7 free of charge. Google launch a new feature that detects suspicious activity in your gmail account for free! It will detect and inform the user for suspicious login in your account. Usually this type of security measures are not given for free and designed for enterprise-level email security only. If it looks like something unusual is going on with your account, the system also alert you by posting a warning message. "Warning: We believe your account was last accessed from…" along with geographic region. By clicking Show details and preferences you’ll see the last account activity and other complete details. Wow! This is a nice to have security feature that I’ve seen for a very long time. Here’s my trick using Yahoo mail! Passwords provide the first line of defense against unauthorized access to your PC. It can be made up of combination of letters, numbers and especial symbols to log on and access programs, files and documents. Making sure that you have strong passwords for all accounts on your computer are very important. Once the command prompt is open, type net user to view the list of users in the system. The great thing is, there is a built-in command in windows that provides a strong random password to user account that you can write down. Just use the command net user [username] /random as shown in the picture above. 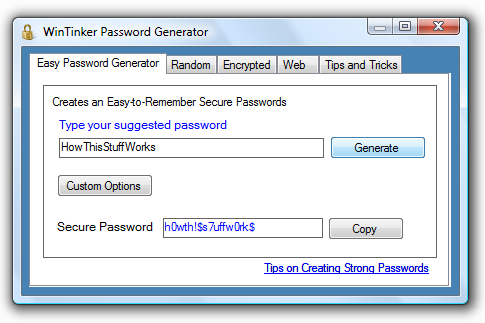 Using Wintinker Password Generator to provide strong, easily-to-remember and hard-to-guess password in any user account. After the new revision of youtube, there are lots of users asking why and how to save these youtube clips for offline viewing and putting them to your music players like ipod and ipod touch. Some of the famous youtube downloader sites like keepvid and savevid went down for few days because of the changes occur at youtube. There is now a clear separation or Youtube.com is now totally not responsible because the youtube links are being generated by the user each time it loads. Again, This guide was created for educational purpose only and the author is not responsible for any illegal purposes. If you decide to save any video, use it at your own risk. Do not sell, share the downloaded videos, and create any illegal use of the guide. You can now get the MP4 format by clicking the bookmarks or favorite while watching any videos. One of the best feature in Windows 7 Media Player is the support for playback capabilities of several known formats such as MOV, MP4, 3GP, M4A, DivX and many more, without installing any codecs. and if you want to play them before you login to Windows. Check out WinBubble, the new version supports the launching the app in the Welcome Screen. Did you ever encounter emptying your recycle bin but the icon doesn’t refresh or change to its original state even if you press F5 key? Changing some settings in your desktop, Taskbar, Start Menu and Windows Explorer, and you did not see the effect that you need to restart or logoff-login again. Here you are! This tip will help you refresh your desktop instantly. Using the newest version of WinBubble, you can easily update the settings in just few clicks! It’s not a 100%-perfect to refresh the Group Policies in the Registry but most of the time, It works! It depends on how you’ll setup the utility. Usually in IE7 and IE8, you need to change the settings in the registry to Modify the default setting of download directory. Using WinBubbles in Windows 7, applying those settings in Internet Explorer is very simple. Heres how to modify the options using the most popular Internet Browsers in Windows 7. Using WinBubble, you can do many useful things in your Windows Machine. Go to IE Tab > At the Miscellaneous Group, simply change the default download directory as shown below or Press the Browse option to find and set the Directory. Finally, Press the Apply to see the results. To change the Download location, you need to go to the icon located as shown in the picture below. Using the Options Menu Item, click the Browse Button to change the Download Location. TIP: If you want to open the Save As File Dialog Window before downloading any file, click the option "Ask where to save each file before downloading". Click the Options Item at the Tools Menu, Main Icon and at the Downloads Group, click the Browse option to find and set the Default Download Directory. If you want the application to to Ask and open the File Download Window before you start Downloading any Files, choose the Second option "Always ask me where to save files". Open the Preference Window as shown in the picture below, go to Advance Tab and Download options. Change the Download directory by clicking the Choose option. Accessing Safari settings is almost the same with Google Chrome. Just choose “other….” option to browse and select the download directory. The Trusted Platform Module (TPM) security is built to newer computers that uses microchip, enables your computer to take advantage of advanced security features such as BitLocker To Go and Drive Encryption. Read here for more details about TPM. To use the Windows BitLocker Drive Encryption features designed to work with compatible Trusted Platform Module (TPM) security hardware, your computer must have a compatible BIOS. Note: If BitLocker and the TPM Management console do not appear to work with your TPM security hardware and BIOS contact your hardware manufacturer for specific configuration and troubleshooting information. To verify if your computer has TPM chip, restart your computer and open the BIOS and check the details to find if the TPM is built into the motherboard. Also, if the TPM driver is installed then it will show up in the Device Manager. It is also accessible from the Control Panel under System Devices in Windows XP and Security Devices in Windows 7 and Vista. The Trusted Platform Module (TPM) security hardware is a microchip that enables your computer to take advantage of advanced security features such as BitLocker To Go and Drive Encryption. It is built into some newer computers. According to MS-Help article, A computer with the TPM can create encryption keys that can only be decrypted by the TPM. The TPM "wraps" encryption keys with its own storage root key, which is stored within the TPM. Therefore, saving the storage root key in the TPM chip rather than your hard disk offers *better* protection against attacks designed to expose your encryption keys. So, It is advisable to check the information that came with your computer to see if your computer is equipped with the TPM. When you start the computer, the TPM checks the operating system for conditions that could indicate a security risk. These conditions could include disk errors, changes to the basic input/output system (BIOS) or other startup components, or an indication that the hard disk has been removed from one computer and is being started in a different computer. If TPM detects one of these security risks, BitLocker keeps the system partition locked until you enter a BitLocker recovery password to unlock it. Open the program WinBubble and go to Windows Utilities Tab or Windows 7 Tab. Click the Maintenance and Advance tools and look for “TPM Initialization Wizard”. WARNING: Modifying the TPM configuration could prevent security applications that rely on the TPM from functioning as expected. After that, your computer will restart again and press F2 to open the BIOS, select the TPM options and activate the settings. Here’s the location of the tool, "%windir%\System32\tpminit.exe". For more Hidden Windows tools, check out WinBubble. If your a keyboard shortcut junkie, hotkeys fanatic and like hidden quick keys in Windows. You might encounter a problem in creating a toggle switch to turn off and on Windows Aero. Probably, you read already the master list of Useful built-in keyboard shortcuts in Windows 7. However, creating your own keyboard shortcut is difficult for those functions that needs elevation. Using the new version of WinBubble, you can get any functionality that you want because it has the capability to launch any application with UAC enabled. Here’s a sample guide in creating a keyboard shortcut for enabling and disabling Windows Aero. Note: C:\Program Files\WinBubble\WinBubble 2\ is the location where you installed the application. Once you installed and use the new version of Windows for several days, you’ll noticed that the Recent Items Menu is gone. Enabling the feature is not so difficult and familiarization is a must because most of the user experienced was enhanced in Windows 7. Right-Click any part of the Windows 7 TaskBar and choose Properties. Press OK to Apply the Settings. The new Maintenance features like System recovery functionality can help you repair system files in Windows if a serious error occurs (no more Windows XP headache). Select a CD/DVD drive and insert a blank disc into the drive. A system repair disc can be used to boot your computer. It also contains system recovery tools that can help you recover Windows from a serious error or restore your computer from a system image. Download WinBubbles, There are lots of built-in tools that you can used for maintenance purposes.